This was a special storytime for kids who are anywhere in the potty training process, from just thinking about starting to newly accomplished potty users, along with their parents. I did warn the adults at the beginning that this was serious and I expected them to sing the potty songs along with me, and they were very cooperative. I put all the song lyrics into PowerPoint and projected them on the wall so everyone could sing along. I have a stuffed mouse that I use for Babytime, and I used her to demonstrate the steps of going to the potty. I asked for suggestions from the kids along the way. We took off pants and undies, sat on the potty (really a bowl), pretended that she peed, wiped with toilet paper, put the clothes back on, and then washed hands. This was a good intro to the basic steps, which were reinforced in the first book. Story: Time to Pee! by Mo Willems. For Mo, this is pretty straightforward. It repeated the basic steps we had just gone through, but also reinforced that it doesn’t take long, so it’s not a bit deal to leave what you’re doing to go potty, and also that it’s ok to have accidents. I was going to follow this with a song I made up called “I Need to Go!” to the tune of “I Am Here & You Are Here,” which also reinforced the steps of using the potty. But I felt like we’d taken care of that already, so I skipped to the next book. 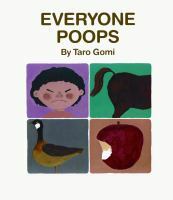 Story: Everyone Poops by Taro Gomi. 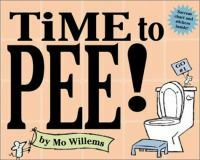 This classic isn’t totally about potty training, but it is about poop, so I figured it would fit. I like how it matter-of-factly talks about poop and the differences between how and where different animals poop, and that kids/people are just treated as one of the many animals. Song: “Itsy Bitsy” from Tinkle, Tinkle Little Tot, by Bruce Lansky. The song in the book had a verse just for pee pee, so I added an identical verse, just substituting poo poo. We sang it through twice. 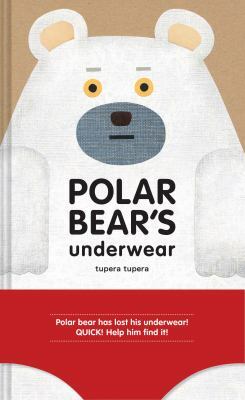 Story: Polar Bear’s Underwear by Tupera Tupera. I have used this in storytime before and it’s generally a hit, plus underwear is peripherally related to pottying, so I figured it would make a nice break from all of the elimination stories. I’m glad I included this, as it was more interactive than the other stories. Song: “If You Pee-Peed in the Potty” from Tinkle, Tinkle Little Tot, by Bruce Lansky. Like the last song, we sang this through twice. This one already had one pee verse and one poop verse. 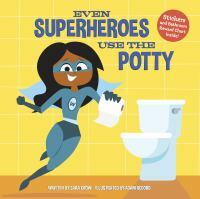 Story: Even Superheroes Use the Potty by Sara Crow. This new book came in while I was planning this storytime, and it was a great addition. The rhyming is sometimes clunky, but it reinforces how everyone, from superheroes to ninjas to teachers to kids, uses the potty. It also introduces lots of different words for the related concepts – pee is also referred to as wee and tinkle, the potty is also the restroom and loo, etc. Activity: I had three paper-based activities to do with mini foam stickers and a variety of drawing tools. 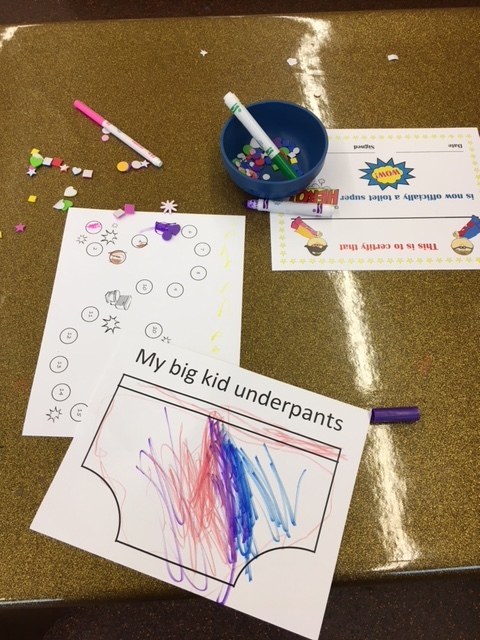 Design your own undies was the most popular (and was a lot less work to put together than the potty chart and certificate), so I might just stick with that for next time. I also had a huge pile of toilet training materials (videos and books for grownups), plus picture books about potty training and underwear. Some people read more books in the room, but not very many were checked out, so I could spend less time on this display in the future. I also left the CD for Tinkle, Tinkle Little Tot playing in the background while the kids worked and the adults socialized. I need to go real bad! Sing cumulatively. Start with the first line, then the chorus, then the first two lines, etc., adding a line each time through. I’m going to pull down my pants. I’m going to sit on the pot. I’m going to make some pee. I’m going to wipe myself. I’m going to flush it down. I’m going to wash my hands.